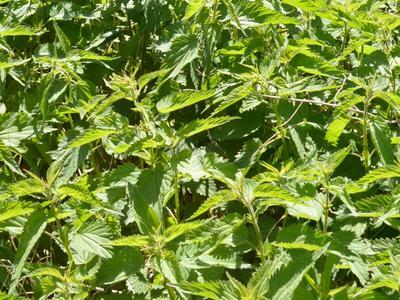 Somewhere in most gardens there is a stinging nettle patch and I expect you like me have a history going back a long time with this interesting plant. I remember my fear of it when young and the rapidity with which I learnt to respect it and also to identify the dock leaf which would sooth its sting. 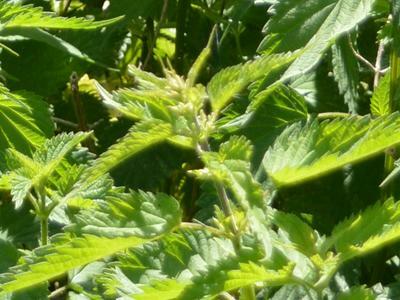 Nowadays I use Weleda Urtica gel, known in English as Combudoron Gel, which is made of nearly 50% stinging nettle and surely must the epitome of the hair of the dog remedy. 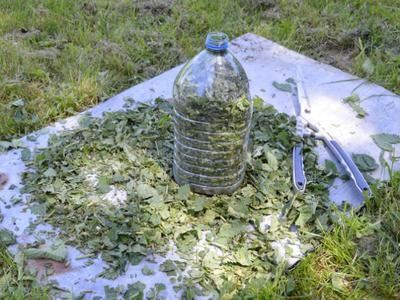 A wonderfully child friendly use of nettles. We use them to fence off unsafe parts of the garden like around the deep ditch behind the barn. Also as companion plants they are very useful as long as they don't get out of hand and I grow them with annual dye plants as well as with aromatic herbs. They are said to strengthen the essential oils in mints four-fold. When young they also make a lovely iron rich vegetable and I believe in Germany they are traditionally eaten on Maundy Thursday. HOWEVER all that said, They can of course also be used for dyeing. If used in enough quantities you will get a lovely green with immersion dyeing on alum mordanted wool and a deep earthy green after an iron modifier. Nettle leaves are also great for eco-printing, with iron they give a striking black print. Finally it is a supplier of fibres to make a course linen like fabric. 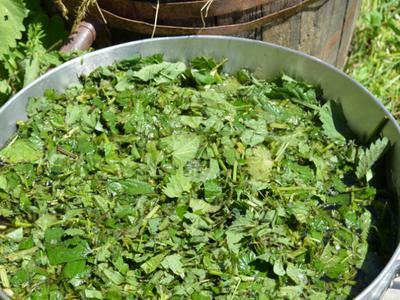 Above is an image of the first stage of fermentation dyeing with nettles. I collected them fairly early in the day before the sun had dragged too much out of them. I am not too happy with their condition at the moment as they are quite leafy having had lots of rain and as with most dye plants the less water in the plant the higher proportion of dye stuffs. Maybe as this is for dyeing and not essential oils I should have collected them later in the day. I feel an experiment coming on! I have added well water and now the flagon is sitting on my garden wall waiting for a good bit of sun to start the fermentation process. Each day I let out the gas ( carefully!) and give it a shake, in that order! In warm weather conditions it should start fermenting in 2-4 days and take 2-3 weeks to ferment itself out so to speak. In between these times it will stink enough to ensure total privacy. When it has finished fermenting I will store it in a cool place to await the August natural dye course where one of the students will be able to explore its dyeing potential.